I recently headed off on a little mid-week trip to Prague with my friend Becky! While I'm sure I could rattle on about the incredible architecture and the must-see sights (side note: the Special Effects Museum is not a must-see sight), this is a food blog. So here's a little overview of what were some of my favourite foods I ate while in the Czech Republic's capital. First of all I want to talk about my hotel! I have a little bit of an obsession with the website Voyage Prive and check it at least once a week for deals even when I'm not intending going on holiday anytime soon. 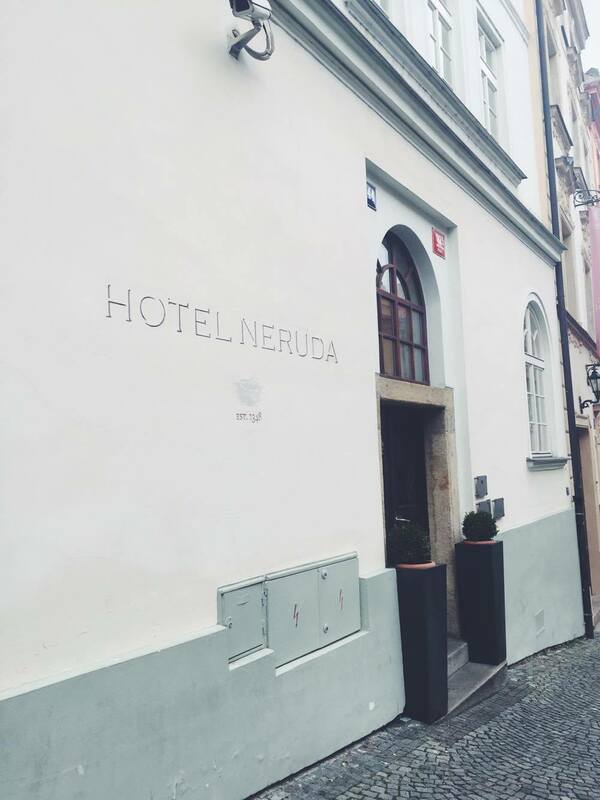 That's where I got an incredibly good deal for the Design Hotel Neruda. Since Voyage Prive discounts only luxury holidays, we ended up with a Superior Room at the hotel. We found it pretty funny that our room was perhaps intended for couples, with its frosted glass toilet and bath visible from the double bed. Included in our amazing deal was an inclusive breakfast buffet. Like Joey Tribbiani, a breakfast buffet is where I win all my money back. I've been to restaurants with much bigger selections, but the quality of the food at Neruda was amazing. I'm still craving one of the little savoury pastries we had. Alongside a selection of savoury and sweet pastries (and tiny pots of Nutella to spread on them) was your basic continental spread of breads, yogurts, cereals, fruits, coffee and tea, as well as a small hot food section with eggs, beans and sausage. You could also order pancakes from the kitchen as a special each morning, but we were too busy stuffing our faces with pastries. 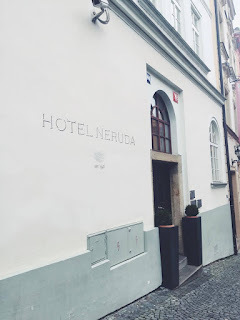 The location of our hotel was perfect for us, we were less than five minutes walk up to Prague Castle and it was packed full of restaurants and street food vendors. On our street was a little restaurant that we actually ended up visiting twice! Restaurace U Mlynáře was a proper little traditional restaurant with checked table cloths and waiters decked out in traditional outfits. I consider myself an ambitious eater so I was fascinated by the Sirloin with Bread Dumplings as it came with a dollop of whipped cream on the side! The highlight was the bread dumplings, I need to learn to make these myself. The low was of course the whipped cream, it wasn't unpleasant to be honest, I just really didn't understand the point of it. Everything about the dish was hearty and warming – with the exception of the cream haha! Speaking of hearty and warming, all we could talk about after a long day of sightseeing and wandering around chilly Prague was a goulash bread-bowl. U Mlynáře's goulash didn't disappoint, it was super tasty and filled the spot. We also shared a pickled cheese starter, which I think was pickled in garlic because it was the most garlic-y thing I've ever eaten. But I love cheese and I love garlic, so I say put your hands together (two Friends referenced in one post!). My only complaint was that there wasn't enough! I was determined to eat the entirety of my bread-bowl, but once the goulash was gone there wasn't much to dip it in. But considering this cost just 190 Czech Korunas, I certainly wasn't complaining! 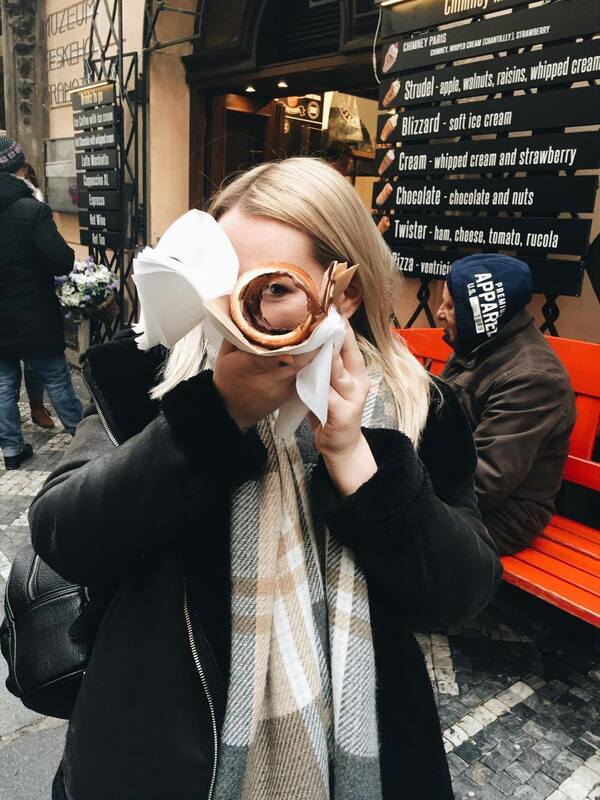 Food in Prague was generally quite cheap if you compare it to other major European cities and probably one of the best cheap eats in Prague is Trdelník. Trdelník is a sweet cake/pastry made from rolled dough wrapped around a stick to form a chimney shape, then grilled and topped with sugar and walnut and cinnamon mix. It's actually traditionally Slovakian and I'm sure the bane of all locals as there are Trdelník stands and shops everywhere! I was so excited to have one of these until I got a whiff of them as sadly I have a mild allergy to cinnamon and these things were definitely covered in them. While Becky went in to have one, I decided to ask a nice woman in one of the shops (called Good Food Coffee and Bakery) if it was possible to make it without cinnamon. Before I'd even given her a reason, she was off into the back kitchen to fetch me a fresh dough, showed me an untouched bag of sugar and told me she would make one without for me. She was so cute and continued to point out my special Trdelník to me and to her co-workers so they wouldn't put any cinnamon on it. Once it was finished they filled it with Nutella. It was so delicious – really crunchy and sweet on the outside from the grilled sugar but warm and soft on the inside. 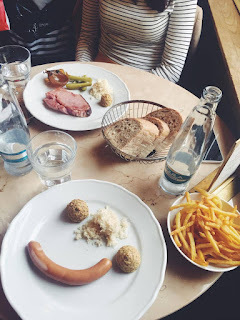 The only foodie disappointment I experienced in my short trip to Prague was Cafe Savoy. I did a little bit of research before going to Prague by following a few Instagram accounts and every snap of Cafe Savoy looked amazing. We went there on our first day for a late lunch after we arrived in Prague. The building itself is spectacular with beautiful ornate ceilings, stunning chandeliers and detailed fixtures. Going down to the toilets there was a big window looking into the chefs at work in the kitchen. The food itself though was really average. I'd seen amazing looking photographs of brunches on Instagram, but this menu must only be available at breakfast or weekends, because the menu we had was pretty tiny and not the best selection. I went for the frankfurter but it was just essentially a hot dog with some mustard and horseradish. I think if you're going to be there for breakfast or just need a little place to stop off for a coffee and a cake then Cafe Savoy is probably pretty great, but I'd pass on the lunch menu! On our last night we also headed down to the Beer Museum to taste some beers. They bring you out planks of little sample sizes of beers for you to try, then you can always order a full size of your favourite one! They have an array of great beers not just Czech as we definitely had a couple of German beers. My top tip – don't try the chocolate flavoured beer it is disgusting. We had an amazing time in Prague, seeing the sights and keeping warm with the hearty food. Prague is the perfect city for a little, affordable city break as if you keep to the traditional Czech food you'll be able to eat for pretty cheap. And don't worry about the cold this time of year, there's plenty of hot wine and hot chocolate vendors about to keep you warmed up!